Prayed. Cried. Prayed some more. Asked advice of family + mentors. I QUIT my FULL TIME job, but I am now going to work part time so I can further my dreams in photography and still have something to lean back on. No, this wasn't easy. I cried ugly sobs when I told them + today on my way home. It was hard leaving a company + people I love, but as much as a bittersweet time this is for me, this is one step that needed to be done for me to be closer to my dreams. I prayed about it. Now is the right time. I live at home, I have the support of my family + boyfriend + my mentors + my amazing clients. I am trying to grow my business as much as possible, my goal in 10 years is to be doing my photography full time + to stay at home with my kid(s) + I am determined to get there. Sam Rust Seafood has been good to me + I can't thank them enough. I have learned a whole lot. It was my first full time job, right out of high school, they opened their doors with open arms and became apart of the SRS family. Cake makes everything better, right? Will + Jessica are two of the sweetest people you will ever meet, put them together and they're sweeter than icing on a cake!! When I first met them, I fell in love with them + the love that they had for each other! I was super excited for their wedding day! They met on an online dating site, met each other, spent some time apart, and came back together even stronger, now happily married. Their engagement session was full of laughs, giggles, and love filling the air. I couldn't help but notice the way he looked at her, so sweet and full of nothing but love for her. Jessica was absolutely STUNNING! Her dress had long pretty lace sleeves (I'm a sucker for lace), and her vale was the icing on the cake! Their day was perfect for them and I couldn't be more thankful to be apart of it! One Sunday in January I went to Freedom Life Church, which I absolutely LOVE!!!!! If you haven't gone you should at least try it, but I bet you'll get hooked! Cyon, who is one of the pastors, was preaching and she will blow your socks off type of good! I was so pumped! She's drop dead gorgeous + has a beautiful family + we decided on Yorktown. After rescheduling twice, due to weather, we got good weather on the third try. We met at Yorktown this past Friday + I photographed her and her pretty belly with her belly button sticking out! I don't know about you other photogs but I get a really good + weird nervous before a session and try to think of everything I want to do and go over how I would like for it to go, and then after, if it goes better than I imagined I get like a "high" and I just can't wait to edit the images, ya know? Well this was one of those sessions!!!! I couldn't be happier with how it went + turned out! We were walking up to our last pit stop in our little area, and she said "Can I make a request?" I said, "Of course, what's that?" She said, "Ever night before bed we pray over my belly, can we take a photo of them praying over my belly how we do at night?" Does that not just give you the chills?? You can see the genuine, love in their eyes! WARNING: This post will contain a lot of exclamation marks (!!!!!) due to my excitement!!! I will start out saying WOW!!!!!! I can not thank you all enough who participated and donated! WE RAISED $580 TO BRING ZANE HOME!!! FIVE HUNDRED & EIGHTY DOLLARS!!!!! I met Susan Fowler from Fowler Studios for a mentoring session back in January and then shortly after I saw their story and immediately I wanted to give, but I didn't know how. I don't have a bunch of money, I am a 19 year old girl, ya know. So one day I was at work and it randomly popped in my head, I would host Mini Sessions to raise money and that I did! All the money raised went straight to Josh + Susan Fowler. I hosted these sessions on March 5th at Sandy Bottom and I had 7 different sessions! I had one family pay for two sessions and then donate them!!! How awesome, right?!?!?!! Thanks to everyone who supported + Susan for bringing this big girl chickfila!!!! Mr. Memphis -- How stinking adorable?!! Damaris -- A young lady who didn't even know she was a model!! I have been missing my sweet, little, DS kiddos, so I have decided to do another special! I will be hosting FREE sessions for children/teenagers with Down Syndrome on the TUESDAYS & SUNDAYS in March! Other days of the week in March will be discounted--$95 OFF!!!!! You can choose a location within a 15 mile radius, one outfit change, and images via a FREE online gallery! Be sure to message me OR fill out the form below to book your session and/or to ask any questions! I can't wait to see everyone & spend one on one time with my Up Syndrome kiddos!!! Couple #2 are high school sweethearts! She was in the show choir, and he was the baseball star. So cute, I know! 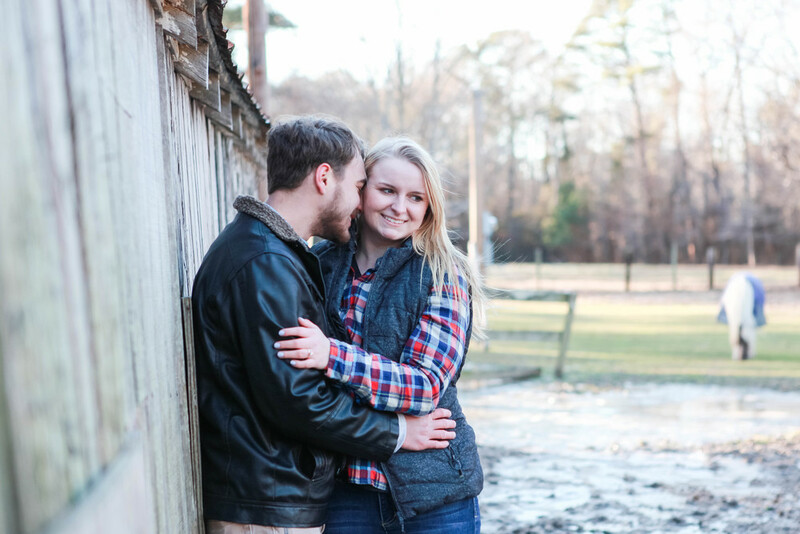 We went out to Colonial Williamsburg for their session, in the snow, which was perfect. The snow would reflect up on their eyes and make them pop, especially Brooke's!! Thank God for here REALLY tall sister!!! The sun was super harsh on them so she held the blanket up to block it for us, even climbed a tree!! Haha. I must say it was so weird saying Brooke this and Brooke that...It's weird saying my own name, haha. There is no denying that they are in love! Sometimes you just meet those couples that are so in love, that it makes the people around them feel good also. They were one of those couples! I was looking for two couples to do engagement photos for me and I knew Josh & Emmy were perfect for this!! I was looking for two love birds that were joyful, genuine and kind hearted. We went to church together when we were in middle school, and have been following each other on Facebook. I have no idea where to start! They were all I asked for and more! Josh is head over heals for her. It shows in the way he looks at her, smiles at her, laughs with her. He "worships" the ground she walks on. He is very happy and content. He puts her first, he is a gentleman. Emmy is so much in love. She is so kind hearted and loving towards him. Together they glow with love and are so much in love they're goofy! Which is the perfect kind of love. It made me happy just being with them. Their love radiates off of them! It was freezing!! So cold that you hurt and couldn't use your fingers, your legs would go numb...BUT we toughed it through! Our session was full of laughs, smiles, kisses, nuzzles and lots of cuddles. I couldn't be any happier with how the session turned out! Calling all love birds!! It is getting to that time where all the girls receive flowers and chocolate and if the guy is really feeling Valentines day then maybe he'll throw in some jewelry! I will be hosting Valentine Mini Sessions January 30, 2016. Minis will be $100, 30 mins, and you will receive images via an online gallery. Time Slots will be: 1:15, 1:45, 2:15, 2:45, 3:15, 3:45, 4:15, 4:45. The set is going to have a romantic feel; roses, wine, a canopy, and more! Also known as my BFF & BIL. It all started at a get together, where they first met on August 25, 2015. Shortly after they met, I met Brianna. We had met up at Chipotle for lunch. We talked for a bit and then told me she was going to a bonfire with friends and this guy she liked was going to be there. So of course I am asking who and she said his name is Sawyer Charters. I wanted to know about him so we sat there for a while and stalked his Facebook (yes we are those people). After awhile of us talking about our men she said "I see potential in him and I." So for the longest time we referred to him as Potential, until they dated. Then he turned into Sawyer. They went on their first date on September 11, 2015. Not too long after their first date they started dating on: September 22, 2015. Sawyer writes poems very well, so he asked her out at a carnival by reading a poem he wrote for. SUPER sweet, I know! On the first date they both knew they were meant to be. Potential was legit. They both fell head over heals for one another. December 7, 2015 Bri wasn't feeling well, so Sawyer took off from work to surprise her. He didn't only surprise her with him showing up, but with also a ring!! He read her a poem he wrote and got down on one knee and asked the question, "Brianna Christine, will you marry me?" She was totally SHOCKED. Of course she said yes! They asked me to photograph them for their invitation! So of course I did and we scheduled it for this past Saturday & it was a blast. Full of laughs, giggles, and lots of LOVE! The love these two have for one another shows beyond extreme. They are so happy and lovey dovey. It makes you happy! Between the love they have for one another as well as the love they have for Jesus and their church is outstanding and is what is going to make this all happen so soon. The awesome Luke & Ashley from Luke & Ashley Photography will be documenting their special day on May 16, 2016. Oh man I just can not wait to see where their future takes them!!! Pray. Pray. Pray. & Pray a little more. If you are the praying type, please pray!! I am sure you all remember Pam. She is the one fighting cancer, I have taken photos of her as well as her family. Well, tomorrow, her and I are flying to Boston!! We are flying out of Richmond and then to Philly and then we should be there by 5ish tomorrow evening. HUGE thanks to Angel Flights!!! Because we are going for medical reasons our flights are free! Such a blessing! The Dana Farber Cancer Center is doing a clinical trial, so we are going to get all the info about it and seeing if she has the requirements to be apart of it. For those of you who don't know, Pam has Stage 4 lung cancer. It has spread throughout her body and has now ended up in her brain. She is almost at her max with radiation and chemo, this clinical trial is like a "last option" of treatment. Pam and I are asking that you keep us in your prayers as we go. Pray that she does ok getting there and back. Pray over the doctors who see her. Pray that she can get this treatment. Pray that everything goes smoothly. Hope everyone rang in the New Year right!! I have had ups and downs this year, but I have used it to grow. I wouldn't be where I am today with out the good, the bad, and everyone's help. 2015 has been such a growing year for me, but I am not sad to see it go! I can't wait to see what 2016 has in store for me!! I will be taking on quite a few more things. COUPLES: I am a hopeless romantic! I love seeing couples grow together, laugh together, and the love they have for each other in their smiles and the way they look at one another. So sweet!! Couples fill the air with love and I adore that! FAMILIES: I have grown up in a tight knit family, so of course I am a family person! I love capturing the love each family member has for everyone. The laughs, the smiles, the goofiness. It hits home for me. MATERNITY: Expecting mothers just have that 'glow,' whether they aren't showing a bit, to where they are 3 months, 6 months, and when they are 9 months just waiting on their precious little bean. They are so nervous and scared but yet so happy and cheery for their little one to come and that fills the air. It makes it so fun to photograph their little and sometimes big bump! WEDDINGS: Yes!!!! The day has come to where I will be taking on weddings and growing in this area!! I haven't had the interest until just recently when I was a second shooter at another wedding. I saw the bride nervous with jitters and butterflies, the groom sweating and pacing, the bride's mom making sure her little sweet thing is ok, the coordinator making sure every little detail is right and that everyone is lined up when need be, and to the pastor saying "you may now kiss your bride." That was when I decided I want to be apart of that. I want to be able to have the honor of capturing their day! I absolutely love capturing the love of two lovers. It makes me so happy to see others happy. The love is overwhelming! Focusing and specializing in these areas give me more of an opportunity to grow with my clients, it does not mean I won't photograph other request, it means I will be pursuing how to grow in those specific areas more than others! I will photograph what you ask of me & pour my heart out into it just like other sessions. Blog, blog, blog & MORE BLOGGING! Like every session! Bring in at least 1-3 new clients a month. Give my clients more of an experience than 2015. I want every client to feel like a rockstar from the time they book to the time they get their images. Soak up all the knowledge possible from any and all photographers that I can! Kudos to Christina from Christina Barnum for the updated headshots!! I love them! I AM NOW BOOKING FOR 2016 & 2017 WEDDINGS! Raging sirens. Lights going. Racing to their call. The average firefighter makes $47,000 a year. That's about 21.50 an hour. That's not a lot. Especially when you're supporting a family. They go through tough training, long nights, sometimes injuries, and they're away from their loved ones. They're the first ones to go in a fire and the last to come out. They drop whatever they're doing, whether that be showering, eating, using the bathroom, whatever, to go to a call in a timely manner. They put their lives on the line every shift somehow, someway. Somedays they are slow, somedays they are super busy. My pawpaw was a firefighter. My grandaddy was a firefighter. My brother wants to be a firefighter. Most people don't get it..
My dad works 24 hour shifts. JCCFD full time & HFD part time. He is away from his family. My dad puts HIS life on the line for STRANGERS. People that he doesn't even know. Sometimes he has to work multiple days in a row. He would miss school events, ball games, family functions, etc. Holidays aren't the same, sometimes he has to work Christmas, Thanksgiving, and Easter, etc. But he's got to do what he's got to do. When he does have to work all the crew's families come up and have dinner, and just enjoy being with them. It's not always easy not having him around a lot, but we make it work. I have a bunch of other moms and dads. We are all a big family. We will surprise him by coming to the station and seeing him. which is a lot fun, in my opinion. Why does he as well as our family sacrifice all this?? Because he LOVES his job & wouldn't trade it for the world. I couldn't be more proud of him for all he does for our family and how hard he works to provide for us. I wouldn't trade being a firefighters daughter for anything. To be quite honest it's fun.